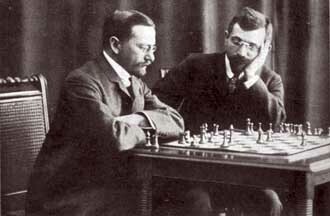 Siegbert Tarrasch, (born March 5, 1862, Breslau, Prussia [now Wrocław, Poland]—died February 17, 1934, Munich, Germany), German chess master and physician who was noted for his books on chess theories. Tarrasch won five major tournaments consecutively between 1888 and 1894. A medical doctor by profession, Tarrasch may have been the best player in the world in the early 1890s. He scored heavily against the aging World Champion Wilhelm Steinitz in tournaments, (+3-0=1), but refused an opportunity to challenge Steinitz for the world title in 1892 because of the demands of his medical practice. His best achievement was probably in 1898 at Vienna, where he tied for first with the American Harry Nelson Pillsbury, whom he defeated in a play-off match. After 1907 he participated in more than 20 international matches but never placed in the top three positions. 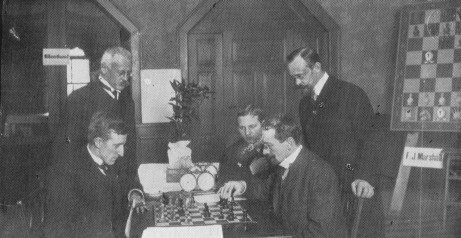 Especially disappointing to him was his loss to Emanuel Lasker (in the main picture Tarrasch and Lasker analyzing together) in 1908 for the world championship. Lasker beat Tarrasch convincingly +8-3=5. Despite his failures, Tarrasch is best remembered for his books, especially The Game of Chess (1935), which developed and popularized Wilhelm Steinitz’s theories while differing with the master about what constituted a small advantage. What can we learn from Dr. Tarrasch? In the next game, we can see how Tarrasch with Black pieces is winning by following two basic strategic elements: Control of the center and passed pawn.